This OIL Lamp is fully garnished with an H. B. 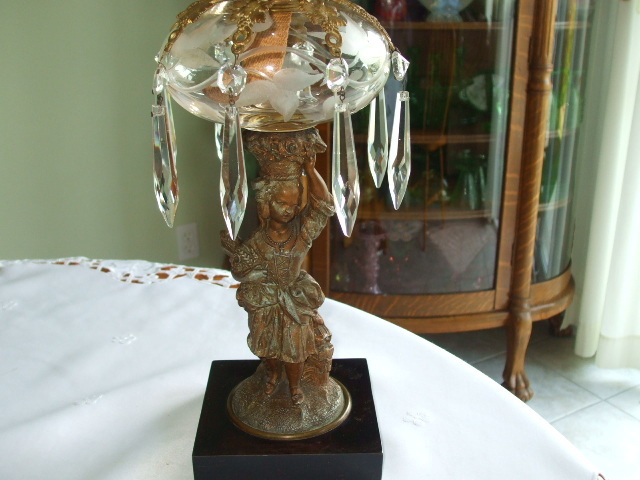 & H. "Star" Burner, (Holmes, Booth & Hayden) of Waterbury Conn. along with a Cut Glass Font, an etched Shade with Birds, a metal base, a brass prism ring with grape leaf designs and of course the beautiful figure stem of a young girl with wheat sheafs and a basket on her head. There is some wear to the original gilding over the spelter figure, otherwise she is quite beautiful. My B & H Catalogue of 1883-84 shows her without a basket on her head so this may be an early model of this lamp. The fine flower cutting on the font & shape also suggests this. 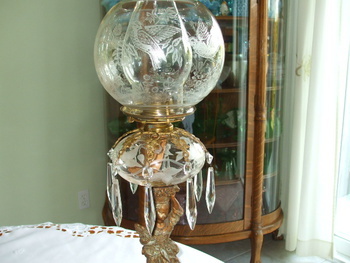 Bradley and Hubbard were one of the most successful American Lamp Companies of the Nineteenth Century. Founded in 1854, they were based in Meriden, Conn. with sales offices in New York, Boston and Chicago. 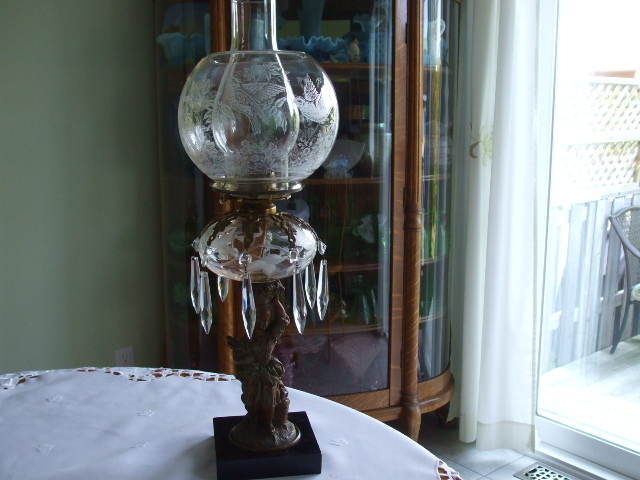 They made a large variety of metal objects, first starting with clocks and bells, then expanding into metal ornaments, gas, kerosene, and eventually electric lighting.